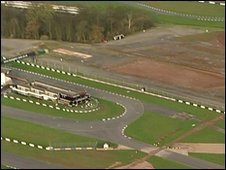 The owner of Donington Park race track has said he hopes to reopen the circuit by August. The venue was left unable to handle motorsport events after a bid to host the Formula 1 Grand Prix collapsed and construction work was halted. Kevin Wheatcroft has now said plans for repairs were being finalised and he was confident of a summer reopening. He added his team were in constant contact with the Motor Sports Association about the project. A spokesman said an "appropriate" race programme for 2010 was being put together and it would be announced as soon as possible. In 2008, Donington Ventures Leisure Limited won the right to stage the British Grand Prix, starting in 2010. But the company failed to get the financial backing to upgrade the circuit and it went into administration in late 2009. The administrators then failed to find a new buyer so the 150-year lease reverted to the Wheatcroft family. Repairs to get the track back into racing condition have been estimated at costing £600,000. But motorsport fans have shown their support for the venue with a number of events aimed at getting it reopened.